Learn How To Make Aate Ka Halwa | Atte Ka Halwa Recipe with a simple video tutorial. 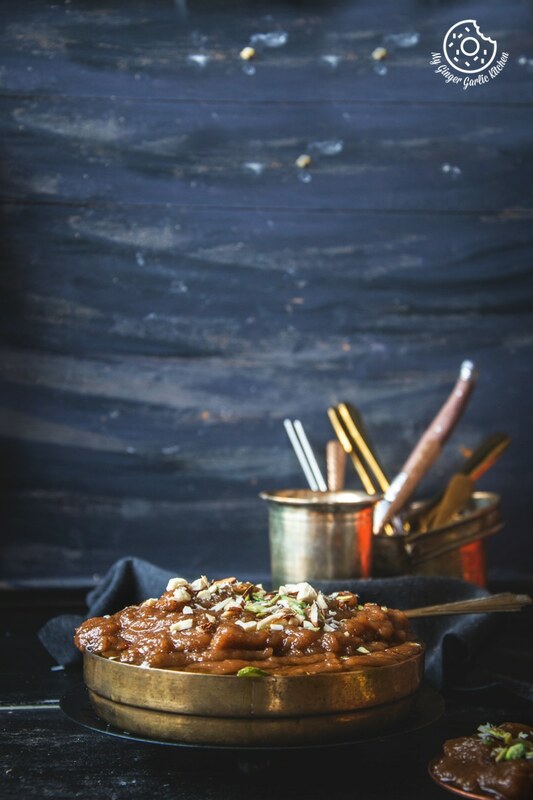 This insanely delicious aate ka halwa is roasted with a generous amount of clarified butter and is sweetened to perfection. The final touch is a hint of aromatic cardamom, some nuts and you are set to relish this blissful and melting in mouth deliciousness. Buttery, moist, smooth, sweet, comforting and so delicious — immediate gratification. Halwa is an Indian style pudding laden with clarified butter aka ghee. 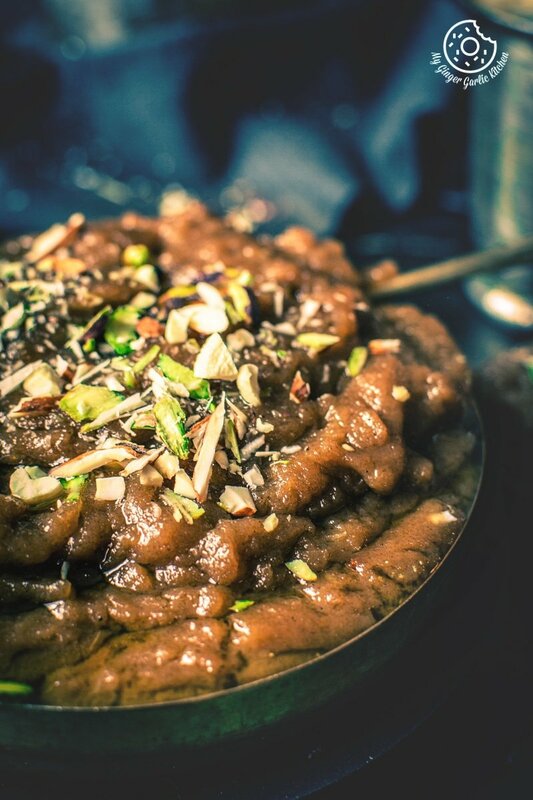 Other than this aate ka halwa, there are also some other popular halwas such as: Suji ka halwa, gajar Ka halwa, moong dal halwa, potato halwa, and pumpkin halwa. What is Aate Ka Halwa? 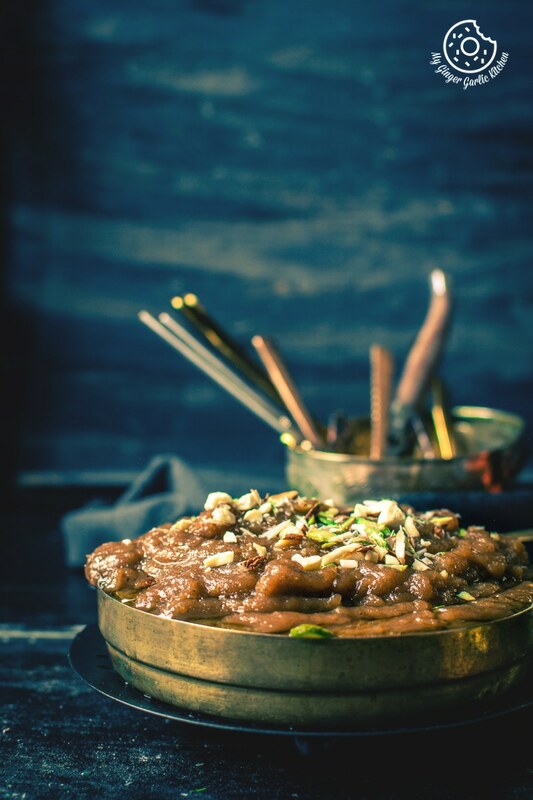 This North Indian style Aate ka Halwa is wholesome and so full of delicious rustic flavors. Wheat flour is Aata/Atta in Hindi, and Halwa is the simple name for any pudding. Thus, this aate ka halwa is the exact translation of wheat flour pudding. This halwa is entirely made with aata / whole wheat flour. This aate ka halwa is my Dad’s one of the favorite desserts. So it was always a failsafe dessert choice to cook for my Mom whenever my Dad had dessert cravings and asked for something sweet all of a sudden. This dessert was surely a hit at my place throughout the year except for summers. It’s not preferred during summers because it makes the body warm, hence sometimes it makes people uncomfortable during the already warm summers. 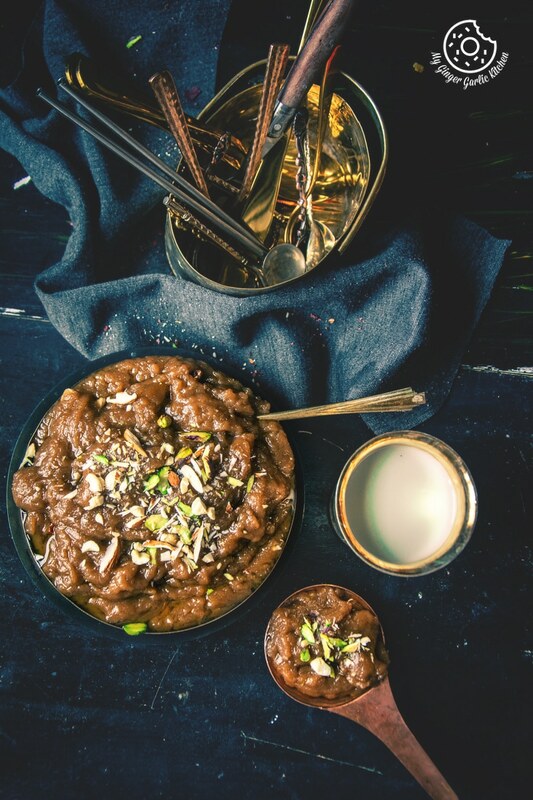 My whole family liked it because making this halwa is super simple and it requires very basic ingredients which are easily available in any Indian kitchen. What are the ingredients you’ll need for making Atte ka Halwa? You’ll only need very few ingredients for cooking this delish dessert Atta Halwa or Aate Ka Halwa. The ingredients you’ll need are: whole wheat flour, ghee (clarified butter), sugar, cardamom powder, almonds, cashews, and water. Is cardamom necessary for this halwa? No, it’s not compulsory. I personally like to add cardamom to this aate ka halwa because it adds a very sweet aroma to it. Is adding loads of ghee necessary for this halwa? I would say, Yes! The amount of desi ghee decides the deliciousness of this halwa. 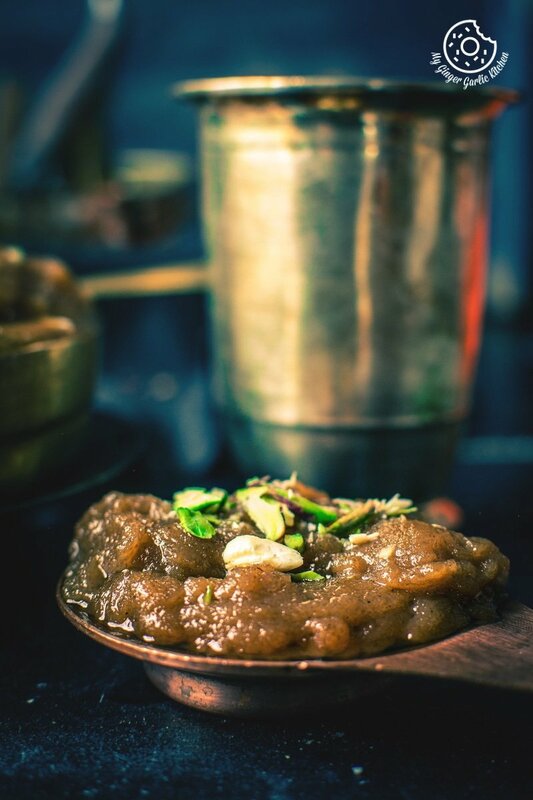 If you want to have the real authentic aate ka halwa which has a silky smooth, soft, moist, and melt-in-mouth texture then you would have to add a generous amount of ghee. 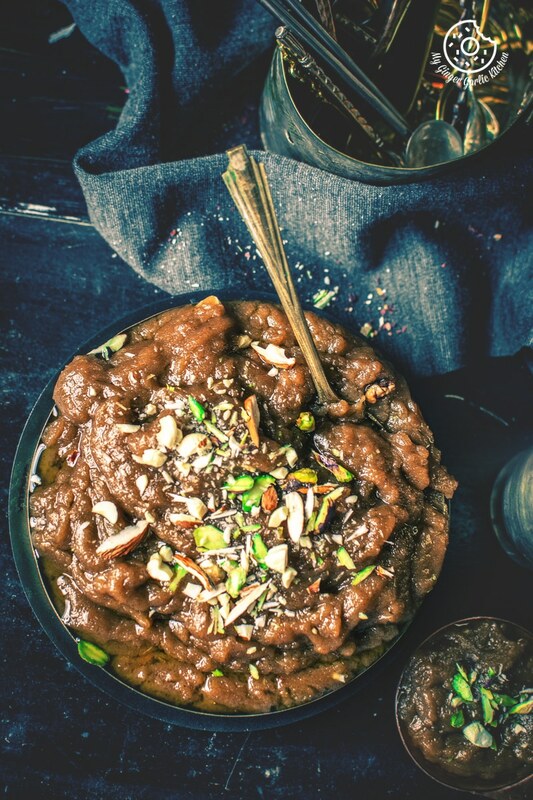 This fabulously delicious Aate ka halwa is definitely doused in desi ghee. What can be served with aate ka halwa? Aate ka halwa generally served as an after meal dessert. But if you want to have it along with meals, then have them with puri. Halwa-puri is a wonderful combination. You can also serve them along with snacks such as pakoras, and Poha. Can I use leftover aate ka halwa? Well, this would be a hard scenario that you have some leftover halwa especially when you have kids at home. But if you still have some halwa, you can refrigerate it and then you can simply warm it up in the microwave for few seconds anytime you want to enjoy it the next day. Are there any dishes which can be made using leftover aate ka halwa? Yes, you can use this halwa as a stuffing for your parathas or toasts. You can also add it to the semolina pudding aka suji ki kheer. Water should be boiling hot for adding to the roasted flour. Be patient while roasting wheat flour for making halwa, because this halwa is always roasted on medium-low flame, so it takes some time and a little effort. But all the efforts are worth it. The good amount (loads) of ghee is the key to making the most delicious and authentic halwa. So don’t be afraid of adding ghee to it. I did not add any raisins aka kishmish to this atte ka halwa, but you can surely add it to this halwa along with almonds and cashews. If you are adding raisins to this halwa, then make sure you soak them in warm water for 10 minutes. I have only added cashews and almonds to this halwa, but you can also add pistachios to this halwa. How long does it take to make aate ka halwa? This halwa can be ready in 30 minutes from start to finish. This is really easy to make. So I would give it an 8. The only thing to be considered is that it only requires continuous stirring. I think that’s the only tough part. When can you make this halwa? 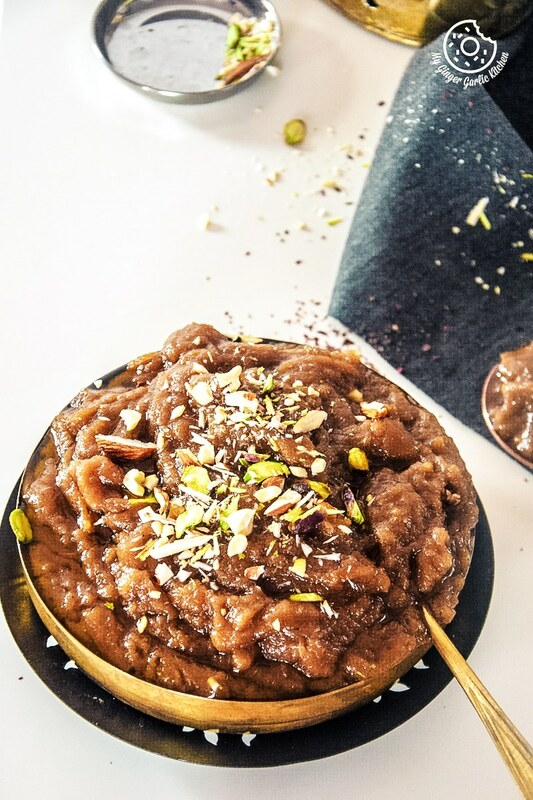 This nutritious halwa can be made during any festivals, occasions or even on the days when you want to have a quick and delicious dessert but don’t want to spend a lot of time in the kitchen. I personally love to have it during the rainy season, and in the winter time along with some piping hot pakoras and some tea. What is the difference between aate ka halwa and kadah prashad? Kadah Prashad or Karah is ‘aate ka halwa’ served as a holy food in gurdwaras. Kadah Prashad is aate ka halwa made with only 3 equal ingredients — whole wheat flour, sugar and ghee. For Karah Prasad (कड़ाहप्रशाद) , it has the same quantity of whole-wheat flour, ghee and sugar, which signifies to the equality of men and women. Karah Prasad should only have 3 ingredients, and anything else is prohibited. The Karah is a sacred food. This is always served in the same size of bowls to everyone in equal portions. However, in aate ka halwa you are free to use flavorings like cardamom and you can also add nuts. And you are not bound to use the same amount of flour, ghee, and sugar. Is this halwa served hot or cold? 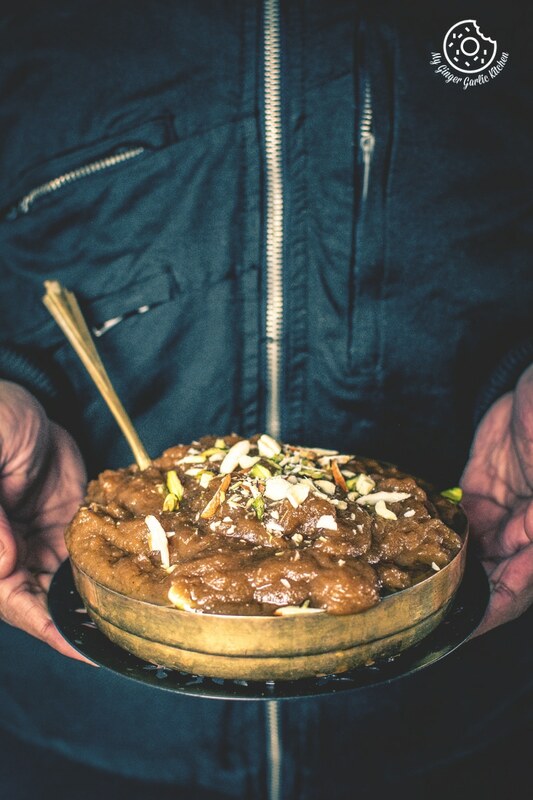 Traditionally, this halwa is served piping hot straight out of the pan. Some like to eat it warm, others like to eat it a room temperature and very few rare people like to eat it cold (Yes, I personally know some of them). I personally don’t like any type of halwa cold because halwa always contains ghee and when it is cold it leaves a weirdly greasy texture in the mouth which I don’t like. So try it in every way and find your desired way of eating this aate ka halwa. I am sure, you might like it in all ways possible. 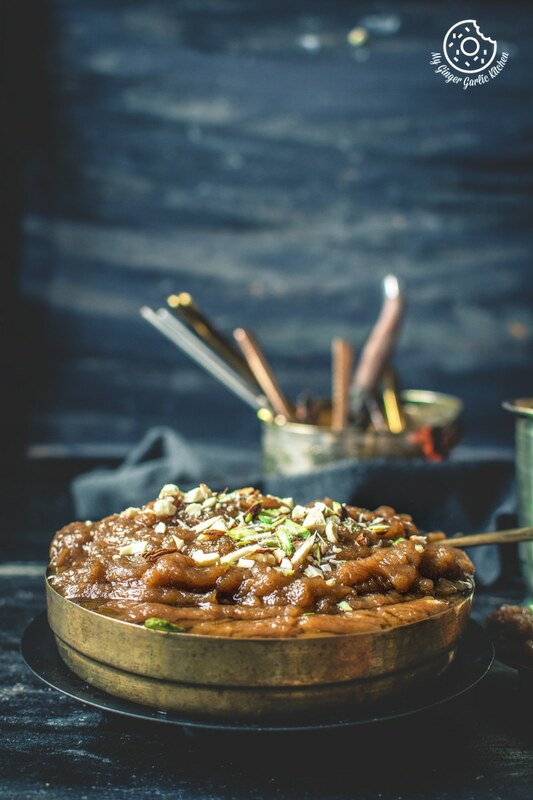 This insanely delicious aate ka halwa is roasted with a generous amount of clarified butter and is sweetened to perfection. The final touch is a hint of aromatic cardamom, some nuts and you are set to relish this blissful and melting in mouth deliciousness. Buttery, moist, smooth, sweet, comforting and so delicious — immediate gratification. 1. Heat ghee in a non-stick or heavy bottomed kadai on a medium-low heat. 2. Add the whole wheat flour and stir well to combine. 3. Stir continuously and roast flour over medium heat till it changes color and turns golden brown. 4. At this point roasted wheat flour should smell very aromatic and roasted flour would release the ghee. 7. Keep stirring until the wheat mixture is golden brown again. 8. Add sugar and stir well to combine. 9. Keep stirring until halwa loses the ghee. 10. Add cardamom powder, chopped almonds, and chopped cashews and mix well. 11. Cook for 2 more minutes. 12. Halwa is ready to serve. 13. Remove from heat, and transfer into serving dishes. 14. Garnish with chopped nuts and serve hot or warm. 1. Water should be boiling hot for adding to the roasted flour. 2. Be patient while roasting wheat flour for making halwa, because this halwa is always roasted on medium-low flame, so it takes some time and a little effort. But all the efforts are worth it. 3. The good amount (loads) of ghee is the key to making the most delicious and authentic halwa. So don’t be afraid of adding ghee to it. 4. I did not add any raisins aka kishmish to this atte ka halwa, but you can surely add it to this halwa along with almonds and cashews. If you are adding raisins to this halwa, then make sure you soak them in warm water for 10 minutes. 5. I have only added cashews and almonds to this halwa, but you can also add pistachios to this halwa.